The Sea ‘N’ Air Parade Returns to San Diego Fleet Week! 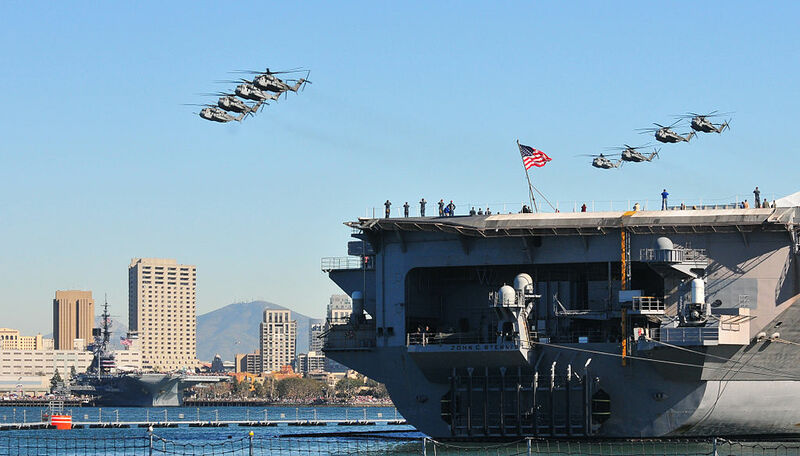 The Sea ‘n’ Air Parade is set to return to San Diego Fleet Week following years of cancellations. The signature event is scheduled for Sept. 10, The San Diego Union- Tribune reported. Six or so Navy vessels will circle San Diego Bay as Navy and Marine aircraft fly overhead. The public will also be allowed to tour some of the ships after they dock at piers on the downtown waterfront. The Sea ‘n’ Air Parade was canceled due to the Sept. 11 attacks but returned the following year. It was put on hold again in 2009 because the ships were needed in other locales and the nation’s defense budget had been tightened, according to the Union-Tribune. However, San Diego-based ships still participated in fleet weeks in other cities along the west coast. They had also been open periodically for tours. U.S. 3rd Fleet Commander Vice Adm. Nora Tyson gave the go-ahead for the parade to return this year, the Union-Tribune reported. “She didn’t understand why San Diego isn’t like all the rest of the fleet weeks,” Larry Blumberg, a retired Navy captain who is chairman of the parade committee, told the newspaper.